After lasting just two outs before being pulled against the Yankees on Sunday, Ryan Borucki was eager to get back on the mound. The Blue Jays left-hander bounced back by allowing two earned runs on seven hits while striking out five in 6 1/3 innings of work, helping Toronto to a 4-2 win over the Philadelphia Phillies Friday night. "I just threw a little bit of a new slider that I haven't thrown in a while, a lot harder and easier to be a little bit more consistent in the zone," said Borucki, who improved to 3-3 in 11 starts this season. "That helped me keep those hitters off balance a little bit." 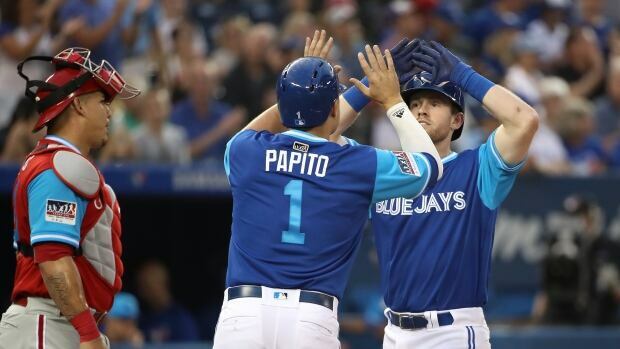 Kendrys Morales and Billy McKinney each hit a home for the Jays (59-69), who have won four straight for the first time since they swept the Baltimore Orioles (June 7-10). Ken Giles pitched a scoreless ninth for his 17th save of the season. Philadelphia (69-59), meanwhile, has lost five of its last six games. Jake Arrieta (9-9) surrendered four earned on six hits while striking out five and walking three over parts of seven innings in the loss. The Phillies opened the scoring in the first inning on a Wilson Ramos sac-fly, which scored Cesar Hernandez. Kevin Pillar showed off his arm strength in the second, gunning down Scott Kingery at the plate. The Phillies shortstop was attempting to score from second base on a Roman Quinn single to shallow centre field. "He got to the ball quick, and Russ [Martin] never panicked because it wasn't an easy play with a guy beating down on you," said Blue Jays manager John Gibbons. "He was nice and relaxed and put the tag down. That wins you games, those types of things." Morales put Toronto on the board in bottom half of the inning by going deep in his fifth straight game, taking Arrieta's 1-2 offering over the wall in left. It was Morales' 19th long ball of the season and tied him with Jose Bautista (2014) for the second longest streak in Blue Jays history. Jose Cruz Jr., owns the record with a home run in six consecutive games for the Jays in 2001. "I'm a little bit more calm when I hit," Morales said of his recent success through an interpreter "I'm using my hands a little bit more and I wasn't using my back leg earlier in the season, I've been driving the ball with it and it's been going good so far." McKinney gave Toronto a 3-1 lead in the third, putting Arrieta's sinker into the seats in left centre field for a two-run home run. Lourdes Gurriel Jr., activated from the disabled list prior to Friday's game, gave the Blue Jays a 4-1 lead after singling home Aledmys Diaz in the fifth. Kingery cut Toronto's lead in half with a solo home run in the seventh to end Borucki's night. "It's all location with him," Gibbons said of Borucki. "I got to give a lot of credit to Russ too, Russ has got that calming affect. He's got that knack for calling the right pitch at the right time. I've seen him do it with young guys here since he arrived. Makes them throw certain pitches, builds confidence in 'em."